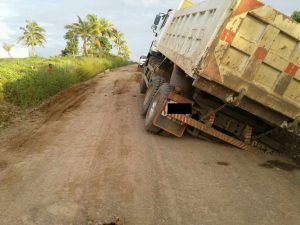 Fiji Roads Authority (FRA) is advising all heavy vehicle owners to comply with the vehicle axle load limits to prevent further deterioration of the road network caused by overloading. This is made even worse with the recent extreme wet weather saturating and weakening the road pavements. FRA General Manager Network Operations and Maintenance Aram Goes made the comments after the team witnessed trucks carting more than the legal load limit in areas such as Dawasamu, Bua, Natewa, Nadi and Rakiraki. He said deliberate overloading needs to be addressed as this could reduce reactive annual maintenance costs up to $30-50M given the growing number of vehicles. Mr Goes disclosed that for even only 1Tonne overload on an axle, the pavement life will reduce from 20 years to 13 years. The Land Transport Authority (LTA) statistics indicate that over half of the vehicles that the LTA manages to weigh are overloaded and many are overloaded by as much as 3-5Tonne per axle. He said rural roads have been particularly hit hard by this phenomenon, mainly because the business owners want to maximise on their profits by overloading vehicles used to transport goods. Mr Goes said a grossly overloaded vehicle would break through the pavement’s ability to absorb the flexibility required, thereafter letting water in. “Overloads are causing much more damage as our roads and bridges are in such poor conditions from the maintenance backlog. He said they were looking at immediate areas of the worst failures to be levelled out into the unsealed road smoothing and major repairs were planned for April. Mr Goes added that the FRA is working with the Land Transport Authority with respect to the Memorandum of Understanding that was signed between them and the Ministry of Infrastructure and the Road Haulage Association on November 2, 2016 on overloading.